The Missoula Osprey, in conjunction with the Arizona Diamondbacks, announced today that Juan Francia, an 11 year veteran of the professional baseball ranks, will be the new Manager for the Missoula Osprey when they take the field this summer. Francia has followed up an 11-year pro career as an infielder with the Tiger and Yankee organizations with 3 seasons as a coach and manager in the Diamondbacks organization. Mike Benjamin, who has managed the O's in each of the last two seasons, will be returning to the team as a coach on Francia's staff. In addition, Manny Garcia is the new Pitching Coach, KC Judge will be the Hitting Coach, Daniel Fifer will be the Athletic Trainer, and Nathan Friedman will return to Missoula for his second season as the Strength and Conditioning Coach. Friedman was the Pioneer League's Strength and Conditioning Coach of the Year last season. Francia is entering his 4th season with the Diamondbacks, all in a coaching capacity. He has spent the last three seasons with the Dbacks Dominican Summer League Rookie team in Boca Chica as a coach in 2016 and manager in 2017 and 2018. His 8-year career as a player included seasons with the Detroit Tigers organization (2000-2006) and the New York Yankees organization (2007). In 2001, he led the New York-Penn League in hitting with a .340 batting average. Then in 2005 he was a midseason All-Star in the Florida State League after hitting .325 in the season's first half. Francia was a middle infielder throughout his career with 900 games at 2B and 291 at SS and has specialized in coaching infielders throughout his time with the Diamondbacks. Mike Benjamin is a welcome return to the Osprey in 2019 as the Bench Coach. "Benji" returns after two successful seasons as the Manager of the franchise. In 2017, he led the Osprey to the playoffs and was the first manager in Osprey history to do so by winning both halves in the season. In 2018, the Osprey narrowly missed the playoffs in both halves and received rave reviews for keeping one of the youngest teams in the league consistent and competitive throughout the entire season. As a player, Benjamin was a star at Arizona State before being drafted in the third round of the 1987 amateur draft by the San Francisco Giants. Benjamin played 13 seasons in the big leagues taking the field for the Giants (1989-1995), Phillies (1996), Red Sox (1997-1998) and Pirates (1999-2000, 2002). Manny Garcia comes to the Osprey as the Pitching Coach after spending the last three seasons as the Pitching Coach for the Dbacks Arizona Rookie League team. During his playing career, also with the Dbacks, he was both a catcher (2008) and a pitcher (2009-2010) giving him an unique perspective that most pitching coaches do not have. This is his 12th season with Arizona as either a player or a coach. K.C. Judge begins his first season in the coaching ranks with the Dbacks. Judge was a 1B/OF for three seasons in Independent Baseball after a collegiate career at California Lutheran University. He will oversee the Osprey hitters as the Hitting Coach in 2019. "The Arizona Diamondbacks have great coaches in the system and we are excited today to announce a veteran field staff led by Juan Francia," said Osprey Executive Vice President Matt Ellis. "Our four coaches have a combined 23 seasons with the Arizona Diamondbacks organization. They know the Diamondback way, they know our players, they know Missoula, and most importantly, they know how to coach. This veteran group will be great for our young Dbacks of the future. I expect our fans will see another year of competitive and talented baseball out of our 2019 Osprey with this staff at the helm." The Osprey and Diamondbacks also announced Daniel Fifer as the Osprey Athletic Trainer and the Strength and Conditioning Coach is Nathan Friedman who will be back in Missoula for a second straight season. The Osprey coaching influence is evident at the major league level, as former Osprey player and manager Andy Green will be in his 4th season as the manager of the San Diego Padres. Former Osprey pitching coach Doug Bochtler is the bullpen coach for the Padres. Former Osprey pitching coach Mel Stottlemyre Jr. joins the Miami Marlins as the pitching coach. Former Missoula Osprey and Arizona Diamondbacks manager Chip Hale returns as the bench coach for the Washington Nationals. Former Osprey Hitting Coach J.R. House is now the 3rd base coach for the Cincinnati Reds. 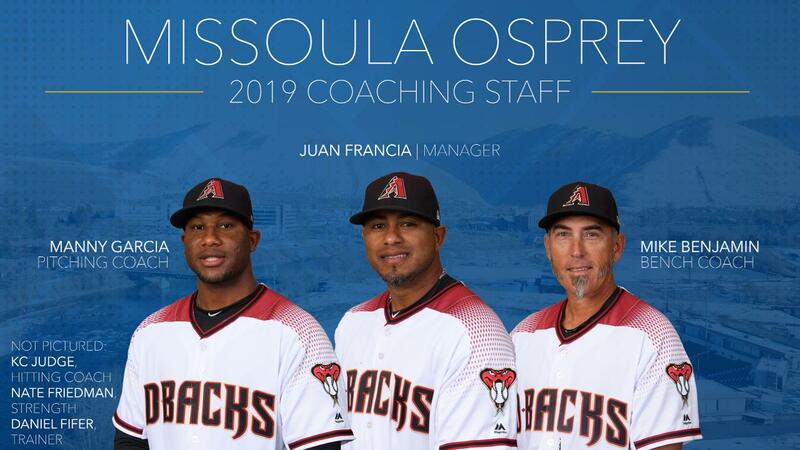 The Arizona Diamondbacks major league coaching staff has two former Missoula Osprey managers on their coaching staff, Tony Perezchica as the third base coach and Robby Hammock as the quality control/catching coach. Former Osprey player Luis Urueta will also be on the Diamondbacks Major League Staff as a coach. In the Diamondbacks minor league system, former Osprey Manager Joe Mather has been promoted and will be in his first season as field and hitting coordinator. Former Osprey Pitching Coaches Gil Heredia and Dan Carlson are the Short-Season Pitching Coordinator and Pitching Coordinator respectively. The 2019 Osprey season will open Friday, June 14th at Great Falls. The Osprey home opener is set for Friday, June 21st, when the O's take on the same Great Falls Voyagers. The first Osprey homestand will run for six games through June 26th. Season tickets and other ticket packages are on sale now at the MSO Hub located at 140 N. Higgins, by phone at (406) 543-330. For more information on the Osprey and our ticket packages check out our website at www.missoulaosprey.com.